"The pork cracklings are freakin' awesome", Bam Bam exclaimed with much enthusiasm. 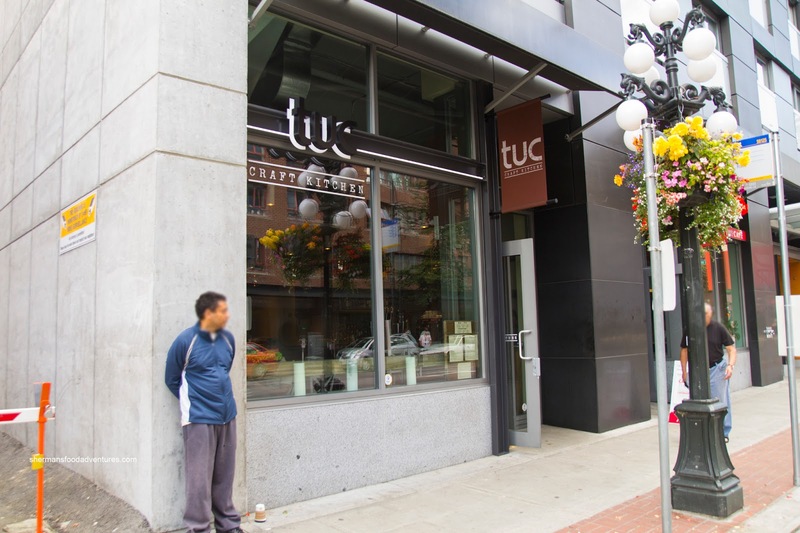 This was during Monday night softball and he just couldn't contain his excitement about his visit to Tuc Craft Kitchen. Okay, when someone says something is "freakin' awesome" I take notice, especially when that someone knows their food. Hence, I made it a point to visit Tuc ASAP. As soon as possible meant a lunch date with Whipping Girl. 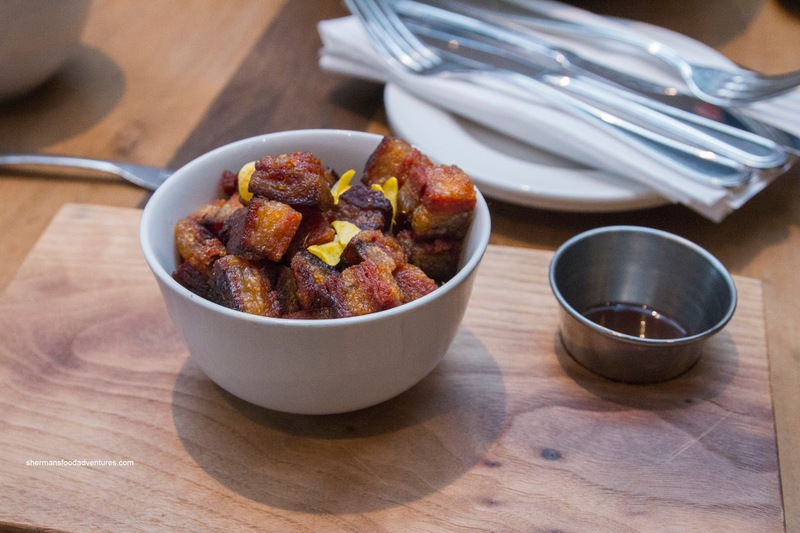 Since both of us already checked out the menu online, we ordered relatively quickly to get to the... Pork Belly Crackling. These little morsels of joy were lightly crisp on the outside with fatty goodness on the inside. 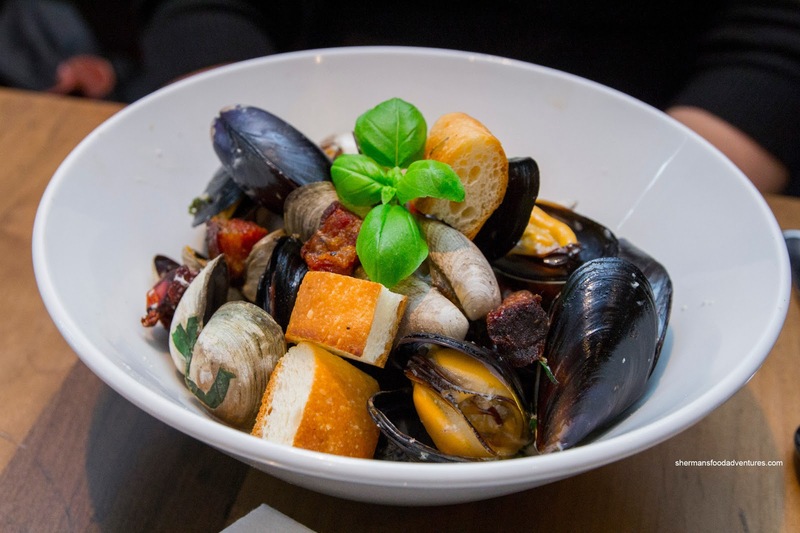 What really made this dish work was the star anise red wine reduction as it provided the necessary acidity as well as sweetness and aromatics. I couldn't stop eating these even though I felt my arteries hardening with every bite. With a light dusting of the same cracklings, the Mussels and Clams were prepared really well. Both were plump and just done sitting in a light white wine cream broth where the alcohol had been properly cooked off. Accenting the dish was more of the cracklings and some crunchy croutons. 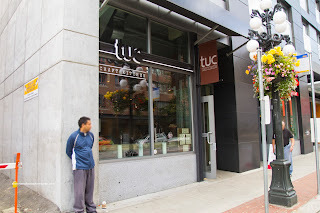 Whipping Girl decided on the Tuc Salad Jardinière for her main. 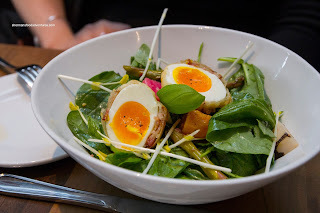 It included arugula, spinach, basil, mint, vinaigrette, pickled vegetables and a tempura & bacon wrapped egg. The salad was pretty much typical salad with a balanced vinaigrette. Yet, the saltiness and crunch of the egg brought the salad to a different level. Since everything had the cracklings already, we thought it would've been good to add it here too. 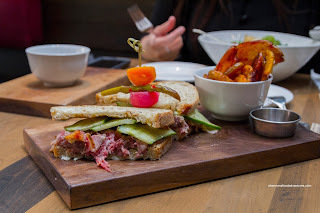 For myself, I had the Beef Brisket and Pork Crackling Sandwich with smashed potato fries. This was a really good concoction consisting of medium-rare fatty brisket, Dijon, salsa verde, cucumber, pickles on whole wheat french bread. There was a nice acidity to the sandwich that cut through the heaviness of the juicy brisket. As much as the cracklings added even more fatty flavour, they were no longer crunchy due to the moisture. The fries were really crunchy and went well with the house-made coriander ketchup as it wasn't too sweet. Although we only sampled 4 items from their menu, the food was both good and interesting enough that we were already planning a dinner visit. Thanks for the advance scouting report. I'm going there Tuesday as part of a group of 10 self-styled "fanatical foodies" and now I'll know better what to order. That many people, who enjoy passing their plates around, I'll get to sample more than four items. Just as importantly, I can sound like a know-it-all: "The caramel popcorn ice cream is supposed to be great!" I like sounding smarter than I am. @BC I'm sure you're smart just for the fact you love food! LOL.